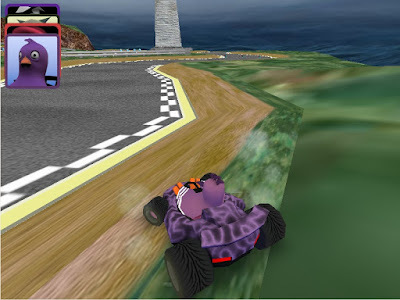 Hi, and welcome to another update on the Irrlicht branch of SuperTuxKart. While screenshots of the menu is interesting, most of the time you'll probably be racing in STK 0.7. So this time I'll show you a couple of in-race screenshots. Btw, the kart I'm driving (the closest one) is the improved version of Nolok. Work is underway for different particles for different terrain. Here, the sand/grass texture shows smoke when skidding on it. It's just a proof of concept; in the end skidding here will most likely show sand or grass particles, while the smoke will be used when skidding on the road. Splash effect when driving into water is among the goodies this feature will bring. 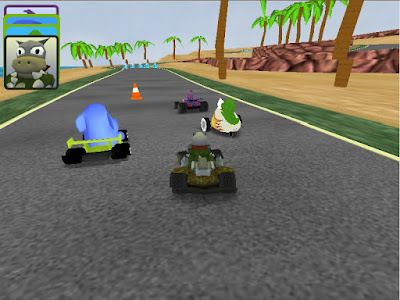 Btw, the kart I'm driving here, is Pidgin, the replacement for Penny. Penny will probably end up as an add-on. Are there any pre-compiled builds for Windows? "Are there any pre-compiled builds for Windows?" No, not yet. Usability and stabilty need to be improved first. Perhaps in a month or two? Time will tell. In that 1680 res looks aswsome! thanks and keep up the good work!